My colleagues in CLF’s Rhode Island office have been doing some important work that deserves attention this legislative session. Two of their efforts stand out: opposing the governor’s attempt to create special legislation to import power from Hydro-Quebec, and opposing the Rhode Island House leadership’s attempt to create a state Commerce Department that would take over permitting functions from the Department of Environmental Management and Coastal Resources Management Council. You’ve likely read more here (or here, or here) about Hydro-Quebec. The company, which (unsurprisingly, given the name) produces power from large-scale hydroelectric dams located throughout the Canadian province of Quebec, has been making a strong push to sell this power to states throughout New England. Hydroelectric power might not be so bad on its own, but Hydro-Quebec has some serious issues. Not least of these is that the most prominent proposal for transmitting additional power from Quebec to New England is a proposed transmission project through New Hampshire – the Northern Pass – that is being developed by New Hampshire’s dirtiest utility and is, in its current form, a deeply flawed proposal that may not provide meaningful environmental benefits. And, also distressingly, Hydro-Quebec has sought special legislation in each of the states it has been courting. Here in Rhode Island, the governor has been pushing one such piece of special legislation; CLF Staff Attorney Jerry Elmer has been pushing back. The governor’s bill would require National Grid (Rhode Island’s only major electric utility) to solicit proposals and then enter into a long-term contract for a large-scale, 150-megawatt hydroelectric project. This requirement would not only displace but likely eliminate local, small-scale renewable projects that the current long-term contracting statute was designed to benefit. At the same time, it would likely drive up energy costs, sending Rhode Island dollars to Canada. And, again, importing more power from Quebec through this mechanism seems calculated to advance the poorly conceived Northern Pass project in New Hampshire. As Jerry told the House Committee on Environment and Natural Resources, it is rare that environmental organizations, energy utilities, existing renewable and conventional power plant owners, and ratepayer advocates unite so seamlessly and forcefully as they have in opposition to the large hydropower bill. And the representatives from these diverse interests all recognized Jerry’s leadership, frequently introducing their own testimony with the phrase, “As Mr. Elmer said …” – certainly a sign of effective advocacy. Meanwhile, Rhode Island House leadership has been touting an “Economic Development Package” of bills designed to enhance the business climate in Rhode Island. Unfortunately, one of these bills would move DEM’s permitting functions and all CRMC programs and functions to a newly created “Executive Office of Commerce.” The purpose of these moves would be to ensure that environmental permitting delays do not hold up business development. At a hearing before the House Finance Committee, CLF Vice President Tricia Jedele pointed out the many reasons this proposed bill makes no sense whether viewed through the prism of policy or law. (You can view her testimony here, beginning midway through minute 162.) 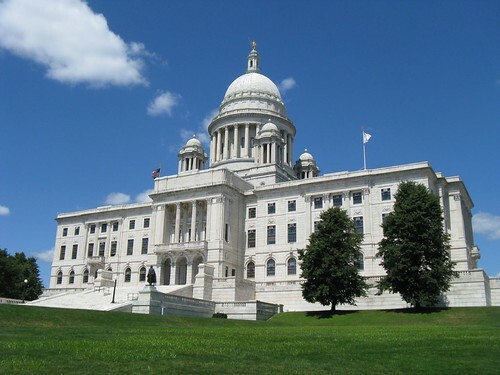 The bill ignores the reasons for permitting delays under the current regime: some delays are the result of the severe staff cutbacks DEM has suffered in the last several years; others are perfectly justified as a way to protect Rhode Island’s greatest asset – its natural resources – against exploitation. Moving permitting functions to a new Executive Office of Commerce would not restore DEM staff or better prevent exploitation. Moreover, the bill suggests a tension between business and environment, even though a robust business climate and a clean, healthy environment can peacefully coexist under an adequate permitting regime. Perhaps most importantly, though, the bill could throw Rhode Island’s environmental permitting programs into total disarray. Many permitting programs are founded on authority delegated to the state by EPA under a host of federal environmental laws. These programs are subject to EPA oversight, and tinkering with them could easily result in EPA’s withdrawing approval and taking over permitting functions itself. Needless to say, this is not the goal of the commerce bill. Instead, Tricia told the Finance Committee, a simple solution would be to leave DEM and CRMC’s functions alone, to staff them adequately, and to add staffers to the new Department of Commerce who can help guide businesses through the permitting process. This argument was well-received, and CLF now has the opportunity to work with the House to reform the bill. Again, my colleagues have been too busy doing this work to call attention to it, but I think it’s important to take a moment to recognize just how valuable they are to Rhode Island and its environment.